Last weekend we were in Adelaide for the craft show at the showgrounds. Friday was really busy and it was wonderful catching up with so many old friends and customers. I actually played with easy peasy silk paper making that day but on Saturday I decided to get out my Inktense Blocks and Evolon and play with these as I love them. You can see that they are broken in the tin above - this is deliberate - they are easy to use when I break them in half. You can use them dry or wet - drop your water brush on the surface to pick up colour - great for mark making - or use them wet - I didn't - I chose to use them dry over stencils because it is an easy way to show one use for them. I created layers of different shapes and colours - sometimes it works and other times it isn't so good. BUT - remember - when you don't like something, colour it with something else (always a Moonglow Spray at the ready) - or cut it up and weave it - or stitch lots of stitching over the surface. You get the idea. Thanks Valerie Campbell-Harding btw. This one was already in my stash too but I wanted to show how easy to draw on the surface - add some water and then some stitch. Now a wee vent - I love to teach and if you follow my ramblings you will know that I don't teach projects - I toss out ideas and hope people will run with them in their own special way. Of course I teach techniques and demo the stuff I use - often it is stuff that you can't get anywhere else or has my own special spin to it. I felt rather insulted recently (shan't say by whom or where) when I was asked if I still teach (this person says she reads my stuff so should not have needed to ask) and would I do a project or do I just do little demos of stuff I sell. I resent that - my business evolved because I needed stuff - I teach as me not as an adjunct to what I sell. If you like my ideas you are free to buy from anyone - of course I use my own stuff - how silly would I be not to? I have spent (with the wonderful Jacinta) a long time developing our beautiful colours and textures and in the textile art side of things - I sell what I like to use - not just any old thing. I am passionate about my art. And I know I would be as bored as can be if I had to teach a specific project - I couldn't imagine anything worse than looking at a group of students holding up clones of my work. I love it when people run with my ideas and I learn so much every time I run a class. No - I haven't fallen off the perch - just been further frustrated by Blogspot trying to write my blog when away. I even have a helpful girl from blogspot trying to sort it but I have loaded blogsy but just need to find the time to work out how to use it. most frustrating. I had a lovely weekend in Rockhampton as guest at the Craft Show - lots of lovely people and a very nice host - Elaine - look what she had in her garden - wow! and this was my messy table full of samples - I always take loads of samples becasue people like to see them and handle them and ask questions - it always shows just how well things stand up to the handling etc. Right now we are getting organized to go to the show in Adelaide http://www.kjex.com.au/Sewing.html tomorrow - set up on Thursday and show opens on Friday to Sunday so we hope to see anyone who is going. I am actually demoing throughout most of the show and have actually got everything organist for this - packed and in the suitcases. Our stuff went last Friday but there has been mountains to do. I have set myself the task of creating work for three exhibitions - one piece has gone but this is another - much larger than I usually do so I have a lot of stitching to do - guess what I will be working on in the plane and in any other moment I can find. I have started stitching though. Good occupation whilst watching Le Tour de France because it is slow go - well they are biking fast enough. 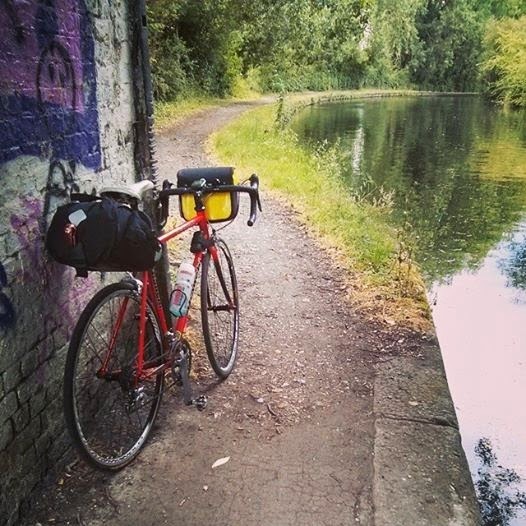 Bruce is in UK biking for 3 weeks - he got to the start of the Tour de France and seems to be having a great time. 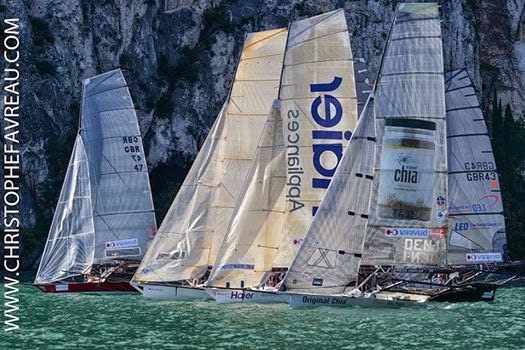 Grant has been sailing on Lake Garda in the European 18ft Skiffs Champs which they won so looks like it is us slogging away at home. Never mind our time will come. and I woke in the night thinking about a new idea and a new project or two - fabulous Boro - this book Bruce and Kazuko bought for me when they were living in Japan - so inspirational and my brain is thinking what next - but really - I must wait until the current deadlines are done. i have also been slogging away starting to get everything sorted for the Broome Artistic retreat next August 22nd and 23rd - all the info should be up on the website next week when we get back from Adelaide.